The outside doesn't have to stay outside. Plant life not typically living in our backyards can thrive. And creativity can bloom, almost effortlessly. All thanks to terrariums. 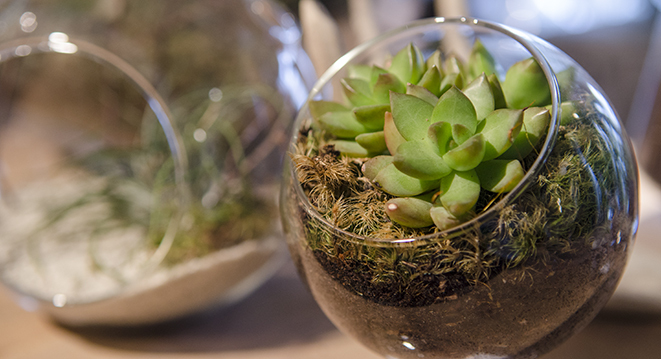 Whether open or closed, terrariums are great for inside a home, an apartment or an office. And because they can be planted in a variety of sizes and fashioned from an even wider variety of materials, they fit into any space and all styles of home décor. Even more, they make perfect party favors and housewarming gifts. 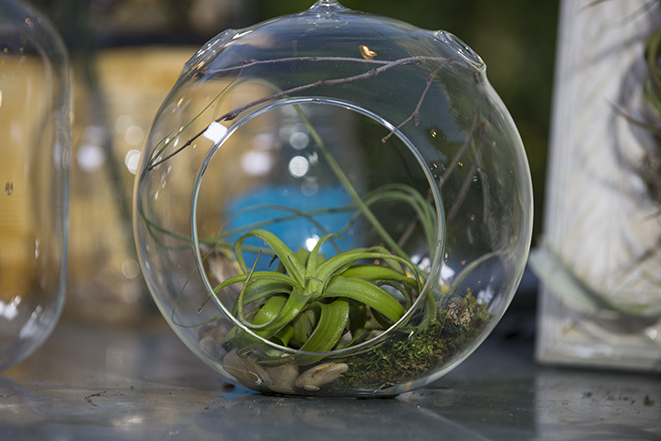 One of the reasons terrariums have increased in popularity is ease of maintenance. In many cases, caring for them requires little more than placing the container in the right setting and watering on a limited basis. 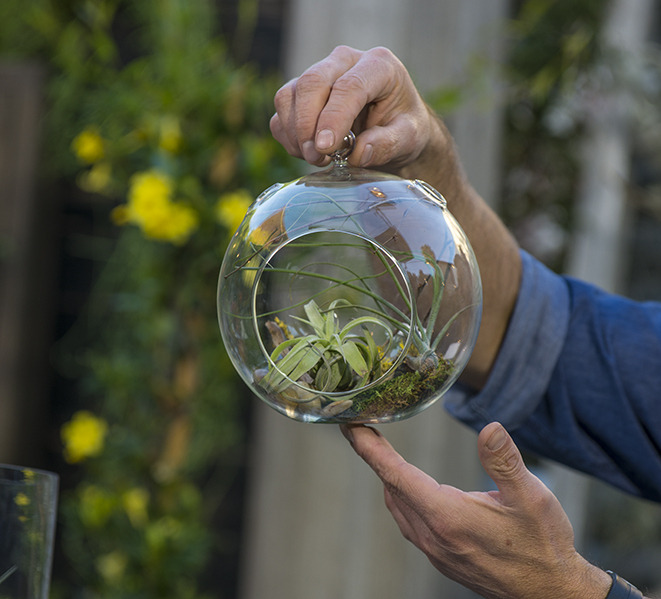 In addition, terrariums provide a natural creative outlet. Beyond the traditional glass vase or fish bowl, these unique container gardens have become growing art. And the possibilities are endless - light bulbs, saltshakers and syrup dispensers, teacups, cider jugs. They can be hung in glass bulbs or empty light fixtures, even inside holiday tree ornaments. For those with a penchant for recycling, terrariums can be fashioned from clear plastic or glass bottles. And when it comes to family projects or activities school children and scouting troops, terrariums are a perfect choice. Although terrariums are easy to maintain, there are some basic decisions to make before starting. For instance, whether you want an open or closed container. Closed containers retain the most humidity and are great for tropical plants. Open containers will create drier environments, either requiring more watering or dry plants, like succulents. Which leads to a second decision - which plants to choose. In many cases, it is best to consider a theme, like woodland or tropical or desert. Even considerations like traditional décor or urban modern. Creating a unifying theme not only helps in the design process, but also ensures that the plants you choose will grow in similar conditions. Mixing plants - like succulents and tropical - that require widely different light, temperature or moisture conditions can quickly become a problem. Whatever container choice, make certain it is clear. Tinted or cloudy glass greatly reduces light transmittance and interferes with plant growth. Step One: Pick your plants based on your preferences, on your décor or potential location. Step Two: Choose your container, again based on your preferences or décor. Make sure your container is clear and big enough to accommodate your plant choice. Step Three: Lay a base. For succulents, it is sand. For ferns and other "wet" plants, start with a thin layer of rock. Step Four: Give it a sense of style, using other materials that allow your terrarium to become a landscape or themed garden. Step Five: Take care of your plants based on the needs of your chosen plants. Succulents require bright light. Open "wet" terrariums require more watering, keeping it moist. Closed terrariums require very little care. But it is best to research your chosen plants to ensure the proper care. Yes, growing is going inside. And it is finding its place in corner offices, on living room bookshelves, and grade school classrooms. It's giving artists a natural outlet and creating new interests in sustainability. All thanks to an idea said to have begun 2,500 years ago in Greece - the terrarium. For more information, visit miracle-gro.com.